Put your paints, brushes and canvas aside! 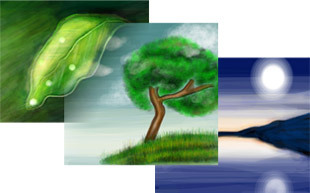 Freehand Painter helps you create vector-based impressive paintings with brilliant effects on your PC. You can try out different artistic styles in this easy to use application. 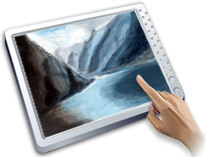 Just doodle on your touch screen PC to create realistic paintings with your fingers. You can achieve the expressiveness of natural media with vector graphics. Its simple user interface keeps everything at your fingertips. It is ideal for anyone who wants to paint or draw on their touch screen computer. Design attractive logos, or create eye-catching web graphics with the simple and adjustable brush tool. Adjust the size of brush tool, with the sliding scale to create colorful lines of various thickness. Use a preset color palette or make your own unique color ranges, to give your painting a professional look and feel. Make your artwork perfect by using Freehand Painter's editing tools. Use the lasso selection to select a shape, just by dragging a marquee around it. Instead of erasing your painting pixel-by-pixel, use the stroke eraser. It erases the entire stroke that you have drawn. 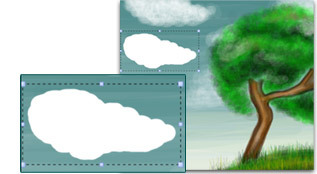 You can compose a painting with several independent layers using the layer functionality. Retouch your painting with a simple click to get lots of amazing effects on your work. 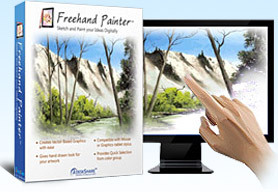 Freehand Painter uses standard ISF(Ink serialized Format) format to save your artwork. Unleash your creativity with Freehand Painter! You'll be amazed how easy it is to create good graphics, without having to spend hours on designing or paying for expensive training. Create Vector Based Graphics with ease. Gives a eye-catching hand drawn look for your creativity. Save your imagination into standard ISF Format. Export your Artwork as PNG, BMP, JPG or GIF file. 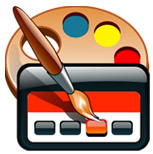 View and create your artwork in full screen mode. Create 100s of vibrant colors to work with. Adjust transparency level for color variations. Erase entire stroke with a single tap. Free-form selection using Lasso tool. Use Undo and Redo actions, to correct your mistakes. Clear your workspace in a single click. Easiest way to get creative with your touch screen PC. Use the gestures supported by Windows 7 touch interface. Thank you very much for Freehand Painter! I've searched for a tool which can be easily used with a graphics tablet for drawing schemes/free-form-ideas. Freehand Painter is the best I could find in this class!